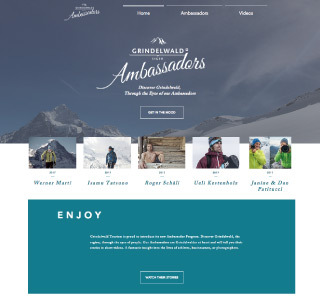 Grindelwald Tourism is proud to introduce its new Ambassador Program. Discover Grindelwald, the region, through the eyes of people. Our Ambassadors are Grindelwalder at heart and will tell you their stories in short videos. A fantastic insight into the lives of athletes, businessmen, or photographers. iscover Grindelwald, through the eyes of Isamu Tatsuno, the founder of Montbell.